Pink China - 576 items found. Picturesque Harper's Ferry, West Virginia. Made by Adams and imported by John Roth. Old English Staffordshire Ware. Dating from 1953-1966. Centennial of the City of Nashua N.H. 1853-1953. The Spalding House, Abbot Square built in 1803, home of Daniel Abbott known as the Father of Nashua. Imported by Jones, McDuffee and Stratton of Boston. Absolutely gorgeous jug with lovely rural scene either side of the body, and very pretty floral border around the rim and along the line of the handle. Backstamp: English Scenic Warranted Staffordshire, Adams England. Light crazing with a little minor discolouration inside to the base. Pink and White. 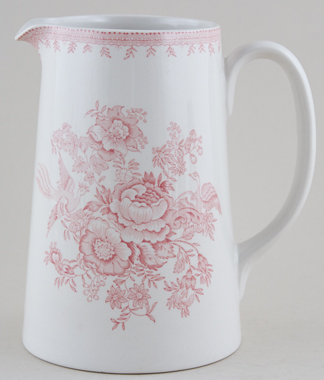 Absolutely gorgeous jug with lovely rural scene either side of the body, and very pretty floral border around the rim and along the line of the handle. Excellent condition. Pink printed backstamp. English Scenic Warranted Staffordshire, Adams England. Fits a 1.75 pint pot. No backstamp. A little very minor wear underneath otherwise excellent condition. Pink & White with white gadrooned rim. Minor wear to the rim and a little on the back otherwise excellent. Pink printed backstamp English Scenic Warranted Staffordshire Adams England. Delightful cup and saucer with lovely rural scene with horses surrounded by a pretty floral border. Backstamps vary, both pink and black printed: Mainly Adams Made in England Real English Ironstone Established 1657. Saucer has light crazing otherwise excellent condition. Barker Bros Ltd of Longton under their Royal Tudor Ware trade name. Round bowl with pretty floral border. Pattern on inside only. Backstamp: Coaching Taverns Hand Engraved by W N Mellor Royal Tudor Ware Staffordshire England Printed Underglaze Permanent Colours Detergent Proof. Small glazing blemish under the rim otherwise fine. Delightful little dish with cover. Backstamp: Pembroke above printed caduceus with Bisto England below. Crazed with a little wear to the side handles and rim of the cover. Introduced to mark the bicentennial of the painter John Constable in 1976. Each item in the series is decorated with a painting by Constable. Lovely plates. Red printed backstamp: The Constable Series Bicentennial 1176-1976 in rural vignette with Broadhurst Ironstone, Underglaze detergent proof, Staffordshire England beneath. Some overall wear, especially to foot rims, although otherwise good condition. With gilt. This is an absolutely gorgeous pattern in hues of pink, blue, green and terracotta all highlighted with gilt Backstamp: Burgess Leigh Middleport Pottery Burslem England Eaton Rd No 389974, impressed Ivory and in script pattern number 3155. Excellent condition. With gilt. 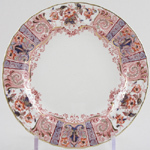 This is an absolutely gorgeous pattern in hues of pink, blue, green and terracotta all highlighted with gilt Backstamp: Burgess Leigh Middleport Pottery Burslem England Eaton Rd No 389974, impressed Ivory and in script pattern number 3155. A little very minor surface scratching and a touch of wear to the gilt otherwise excellent condition. With gilt. This is an absolutely gorgeous pattern in hues of pink, blue, green and terracotta all highlighted with gilt. Backstamp: Burgess Leigh Middleport Pottery Burslem England Eaton Rd No 389974, impressed Ivory and in script pattern number 3155. There is a little minor discolouration to a small part of the rim, a touch of wear to the gilt and some glazing blemishes on the back but overall excellent conditon. With gilt. This is an absolutely gorgeous pattern in hues of pink, blue, green and terracotta all highlighted with gilt Backstamp: Burgess Leigh Middleport Pottery Burslem England Eaton Rd No 389974, and in script pattern number 3155. With gilt. This is an absolutely gorgeous pattern in hues of pink, blue, green and terracotta all highlighted with gilt Backstamp: Burgess Leigh Middleport Pottery Burslem England Eaton Rd No 389974, and in script pattern number 3155. Crazed with some discolouration mainly inside the tureen, inside the cover and underneath the stand. Overall a gorgeous little set. With gilt. This is an absolutely gorgeous pattern in hues of pink, blue, green and terracotta all highlighted with gilt Backstamp: Burgess Leigh Middleport Pottery Burslem England Eaton Rd No 389974 and in script pattern number 3155. A little very minor surface scratching and wear to the gilt, overall excellent condition. With gilt. This is an absolutely gorgeous pattern in hues of pink, blue, green and terracotta all highlighted with gilt. Backstamp: Burgess Leigh Middleport Pottery Burslem England Eaton Rd No 389974 and in script pattern number 3155. A little very minor surface scratching and wear to the gilt, overall excellent condition. With gilt. This is an absolutely gorgeous pattern in hues of pink, blue, green and terracotta all highlighted with gilt Backstamp: Burgess Leigh Middleport Pottery Burslem England Eaton Rd No 389974 and in script pattern number 3155. A little surface scratching and touch of wear to the gilt, overall excellent condition. With gilt. This is an absolutely gorgeous pattern in hues of pink, blue, green and terracotta all highlighted with gilt Backstamp: Burgess Leigh Middleport Pottery Burslem England Eaton Rd No 389974 and in script pattern number 3155. A few minor signs of wear, overall excellent condition. Made in England. Brand new and first quality, dishwasher and microwave safe. Pink Arden. This item has been discontinued by Burleigh and is no longer available. Made in England. Brand new and first quality, dishwasher and microwave safe. Pink Arden. Replacement lid for the smaller round 1 pint 0.6 ltr teapot. Minor variations in size may result in a replacement lid fitting less well than the original. This item has been discontinued by Burleigh and is no longer available. Made in England. Brand new and first quality, dishwasher and microwave safe. Pink Arden. Replacement lid for the larger round 1.75 pint 1.05 ltr teapot. Minor variations in size may result in a replacement lid fitting less well than the original. This item has been discontinued by Burleigh and is no longer available. Made in England. Brand new and first quality, dishwasher and microwave safe. Pink Arden. There is a cut out in the lid for a spoon. This item has been discontinued by Burleigh and is no longer available. Made in England. Brand new and first quality, dishwasher and microwave safe. Pink Arden. Saucer 5.75 ins 14.5 cm diameter. This item has been discontinued by Burleigh and is no longer available. Made in England. Brand new and first quality, dishwasher and microwave safe. Pink Arden. Saucer 6.5 ins 16.5 cm diameter This item has been discontinued by Burleigh and is no longer available. Made in England. Brand new and first quality, dishwasher and microwave safe. Pink Asiatic Pheasants. This item has been discontinued by Burleigh and is no longer available. Made in England. Brand new and first quality, dishwasher and microwave safe. Pink Asiatic Pheasants. There is a cut out in the lid for a spoon. This item has been discontinued by Burleigh and is no longer available.